We are happy to share the general availability of SAP Cloud Platform Business Rules for productive usage in all SAP Cloud Platform data center. This is the second service covering our BPM Cloud services family and complements SAP Cloud Platform Workflow. SAP Cloud Platform Business Rules targets line of business users(knowledge experts) and application developers deprived of flexibly changing business decision logic as and when their market conditions or business policies changes. It supports them with a Manage Business Rules Project application to configure a business rules project and capturing the different decision logic required using Decision Table rules and rulesets. The service also offers the Business Rule Management engine as service to invoke the rule service using REST APIs. The service intends to integrate/aggregate the different rule technologies in SAP like SAP Business Rules Framework plus(BRFplus), SAP Business Rules Management(BRM), SAP HANA Rules Framework(HRF) by providing a common and central rule design time repository for rule authoring, governance, life-cycle management while enabling the flexibility to deploy the rule runtime in the appropriate backend technology like ABAP, HANA, JAVA, there by ensuring the execution of Business Rules in an environment very close to the application logic. To achieve this vision we have introduced a common meta-model for business rules which is called SAP Enterprise Rule Model. The goal of this model is to simplify the concepts in Business Rules Domain and ensure SAP Customers, Partners, Users, Consultants use ONE approach when they are in need of using business rules in their applications. This model is also aligned with industry standards like Decision Model and Notation to make it open in nature for future contribution from the eco-system. This usage pattern is targeting cloud native applications built on SAP Cloud Platform with a certain backend logic in the cloud for an application area. There are different ways to extend the backend logic e.g the data can be replicated from on premise system and used in the cloud persistency or the backend might involve connectivity to other APIs from on premise and cloud applications. However the most crucial extension layer is the business logic layer that needs to be kept flexible in cloud applications. 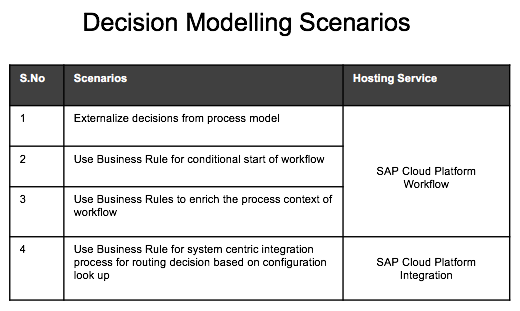 This business logic layer which involves business decisions are covered by SAP Cloud Platform Business Rules. Consider for example a simple Shopping Cart or Web Shop application that provides discounts based on customer purchase. To ensure the Web Shop has a competitive advantage over local promotions the offers needs to change dynamically based on market situation. Here Business Rules can be used for In App extensibility of the cloud application. It is IN APP as business rules enables reorganising the business logic within the application. Another example can be a partner application meant for a line of business solution. Here for each customer/tenant of the partner this OEM(Original Equipment Manufacturer) application needs some customisation or business configuration. Business Rules provides this initial business configuration which each tenant or customer of the Partner can setup during application on boarding there by enabling the app developer(Partner in this case) to provide an IN APP extension capability. 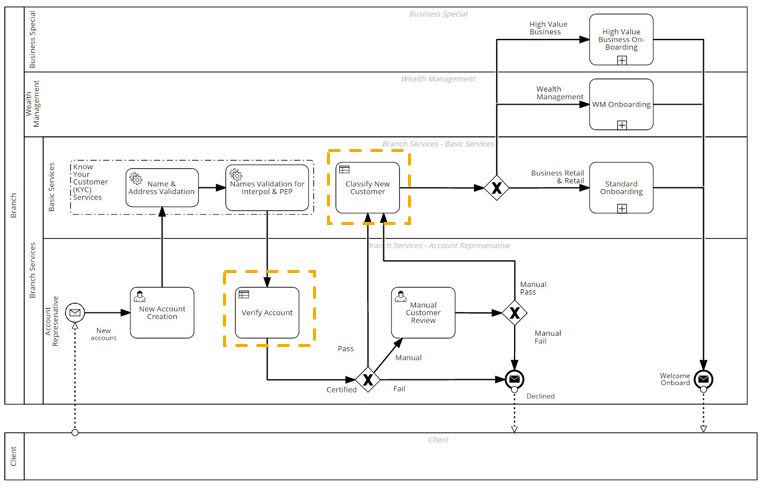 This usage pattern is a very common synergy between BPMN and DMN(image Source) where SAP Cloud Platform is used for extending the core processes of a Customer Enterprise system. These process centric extensions uses either SAP Cloud Platform Workflow or SAP Cloud Platform Integration or a combination of both. In these cases it is a best practice not to hardcode the business decisions in a script task as it forces a Developer to be involved in re-developing the logic when the business requirements changes. Business Rules enables a knowledge expert to directly change the conditions as and when the business policies changes.The developer needs to only introduce the decision interface in the process and provide an execution context for it. Secondly by encapsulating the decision logic in a Business Rule the overall process diagram or process flow is much more simplified and readable. IoT (Internet of Things) for Data Ingestion and IoT Gateway Edge. Transitioning your existing BRFplus projects to SAP Cloud Platform Business Rules. Hi Ramana, thanks for this, and congrats to the team for getting to GA. I am very encouraged by the direction, and the combination of rule definition standardisation, along with availability of a design and runtime on SCP, is great. I was just wondering – I’ve checked the Business Rules in the SCP Roadmap (latest roadmap doc I found was 20170516) and while there’s mention of, for example, support for additional rule formats in the roadmap, there’s no mention of facilities for transporting business rules projects, or data within rule decision tables, between tiers (subaccounts). Can you please let us know what the position is on this? We are uploading a more detailed roadmap for Business Rules in the sap.com/roadmaps Here i have highlighted the additional public APIs being planned that enables export/import of the Business Rules Project as archive. I will paste the link once the document is available in the public site. In the meanwhile we also provide import updates in the consolidated SAP Cloud Platform roadmap which will also get updated very soon. Solution we are intending is to manually download and upload the entire Business Rules project archive from one tenant to another. More sophisticated transport mechanism are planned for next year. The detailed roadmap is published, sap.com/roadmaps under products and solutions. In the SAP Cloud Platform section find a separate line item for SAP Cloud Platform Business Rules. You will find some details on new rule formats under planned innovations. Thanks. Looking forward to seeing when the transport / import-export features will appearing in the roadmap. Cheers! Hi DJ, I noticed that the roadmap has been made available now and it contains information around life-cycle management. also from my side gratulation for going GA! As you plan on local rule engines, have you thought on providing a local rule engine for offline applicaions, like SMP SDK Kapsel based application and esp. the “new kid in town” SAP Enterprise App Modeler based native applications? We see a real need for this in our consulting and development projects! Feel free to discuss the new SAP Cloud Platform Business Rules offer with us at SAP TechEd 2017! I will be attending Las Vegas and Barcelona. Several Rules experts from the dev team will be there as well. We can show and explain how SAP Cloud Platform Business Rules works today and how it will transition into a holistic approach that is in perfect harmony with BRFplus/DSM. We have SCP Neo for our Enterprise tenant. However, we do not see the Business Rules option. Also, we did not buy SCP Workflow. Does the Business rules availability depend on whether we bought SCP workflow or not? Appreciate any help.